Adri Duivesteijn, alderman for physical planning and housing, opened the exhibition TEAMWORK in Museum De Paviljoens in Almere on October 31. It’s called ‘teamwork’ because the local authority invited three property developers to present proposals for the development of the Coastal Zone in Almere Poort, and because Museum De Paviljoens set three teams of artists to work with the same programme. The first versions of the six proposals are currently on show, and the definitive designs will go on show from January 24, 2009, on. In the run-up to the presentation of the definitive plans, the people of Almere have been invited to give their views and share their ideas. The organisers are hoping that the property developers and the artists will influence one another. The result is a motley collection of proposals that take different and sometimes surprising approaches to the most make-able town in the Netherlands. The proposals from the three property developers Vesteda, Amvest and BPF Bouwinvest are ambitious. They aim to impress and spare no expense with numerous references to bathing resorts at home and abroad. Almere should become the Strand City of the Randstad, as former Chief City Architect Francine Houben once called it. With a plan entitled Almere Coast as Symbol for Almere, Vesteda focuses on a combination of cosy urbanity and beach life. Wide boulevards along the beach shape the coast as a symbol. The design is divided into four different worlds that are linked to one another by a green spine. It is a neat but predictable vision with imposing apartments to the north, a cosy bustling harbour in the centre and a bay with a recreational beach to the south. Amvest dreams of real sandy dunes in its proposal entitled 'Beach and Dunes'. Three 10-metre-tall dunes are positioned perpendicular to the dike and connect the beach to the landscape behind. All residents of this new town district can therefore experience the unique beach feeling. The ambition of Amvest is to develop the area as the most sustainable neighbourhood in Almere. It plans to achieve this by improving the ecology of the IJmeer and Markermeer lakes and by building energy-neutral dwellings. Images of a magnolia valley and streams of clean water enhance this feeling, as do the many urban amenities anticipated by Amvest and other property developers. The plan entitled 'From Low Polder to Great Heights' by BPF Bouwinvest takes the dike as its starting point. Since the start of land reclamation, the people of Flevoland have literally been looking at the dike. In studies and proposals drawn up by her office, Francien Houben has recommended looking over the dike. Build on and over the dike and give the people a wide view across the water. Make the most of this residential quality as a unique selling point for Almere, says Houben. The vision presented by BPF responds to this way of thinking and widens the dike, as though it was bordering the North Sea, with hills, undulations and views. A wooden boardwalk connects the centre (designed as a harbour on the Zuiderzee) with the beach and the park. According to BPF, the strength lies in social solidarity and quality of life, not in bricks and mortar. But the plan is ambiguous about how to achieve this. The three teams of artists are more modest in their approach. What is striking is that they all work on the basis of Almeres existing characteristics. To many people Almere is a new town, hopelessly searching for its own image and identity. By searching for existing characteristics and highlighting these, the artists emphasise that a unique place can be created, incomparable to the ambitious and often hermetic reference images of the property developers. 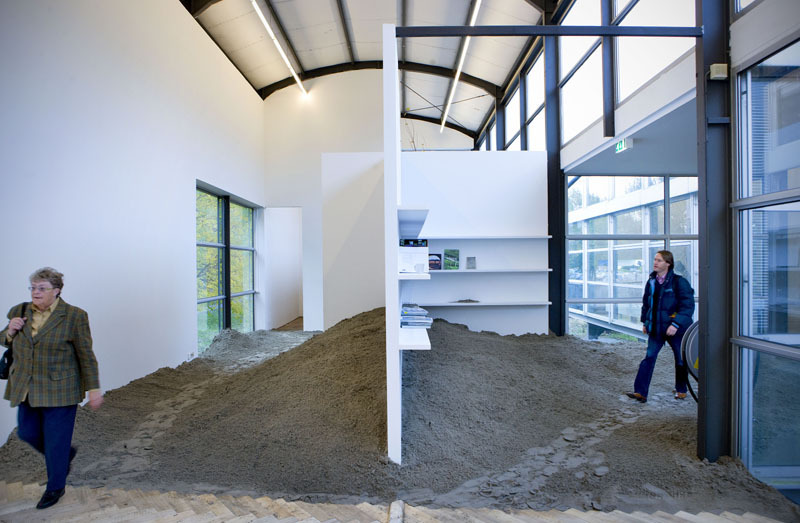 You enter the exhibition through a huge hill of sand that slopes through Museum De Paviljoens. The 'Almeerder Zand' (2008) is a changing sand sculpture without a definitive form. In the eyes of Stefan Bendiks and Aglaée Degros of Artgineering, the design never reaches completion but just has a beginning. That beginning is the sandy soil, familiar to the people of Almere. Over time, buildings find their place on and in the sand. 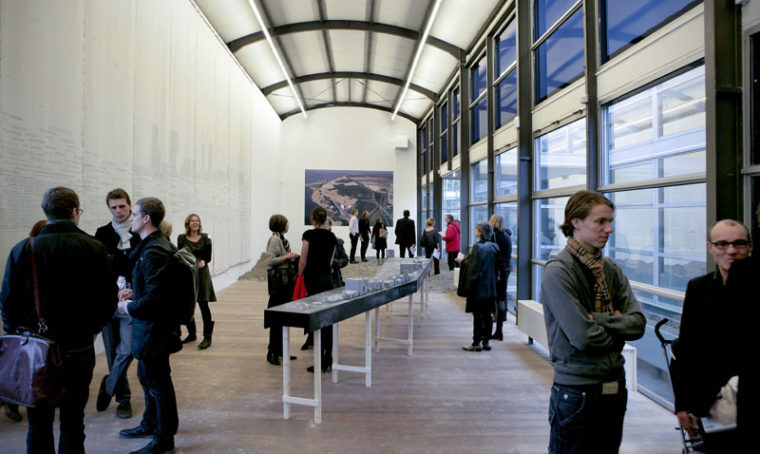 Irene Fortuyn, Arno Vriends and Arjan Karssen of Ketter & Co dissect the city in three ways in 'Cityscape Almere' (2008), 'Atlas Almere' (2008) and 'Sketchbook Almere' (2008). 'Cityscape Almere' shows what Almere really is through an objective portrait. Irene Fortuyn took the town plan as the starting point and took photographs in all four directions from the junctions of the north-south and east-west axes. The diversity revealed is surprising not only for people from Almere but also for people who do not live there. 'Atlas Almere' features words from original publications about Almere: interviews with designers and residents, policy plans and visions. The words form the fabric of the townscape on a huge tapestry. Residents themselves can get working with the 'Sketchbook Almere. 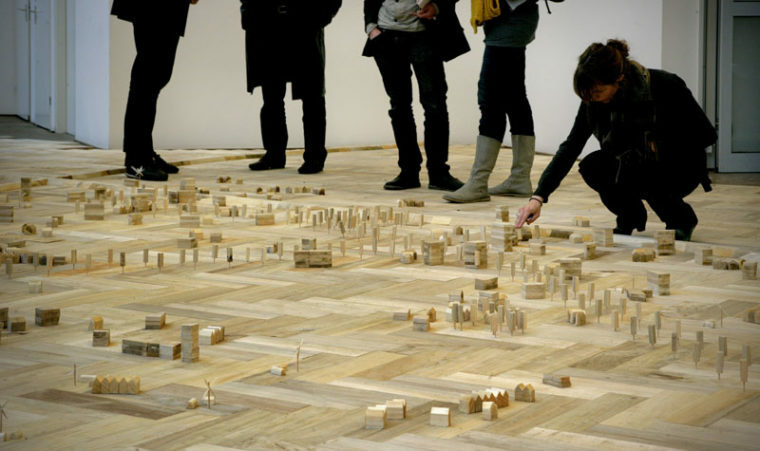 They can create their own plan with cut-outs of archetypical buildings in Almere and with the woods and windbreaks so typical of this town. Its a way of generating discussion. But its the Parquette Settlement Game (1991-2008) by Hans Venhuizen (Bureau Venhuizen) that best reflects the pioneering spirit of Almere. He came up with the Parquette (a contraction of parquet and maquette) method in 1990. Its a way of creating history in places where history is largely absent. Two groups with conflicting interests, in this case the self-sufficient pioneers and the homebuyers, play against each other. The game fills the area and forms the starting point of the design process. Venhuizens idea is to arrive at a more meaningful design because the conflicting interests are inextricably linked to one another and new plans have to take this into account. The three property developers propose clear finished images for the Almere Poort coastal zone as a way of creating the missing identity of Almere, especially with lots of amenities aimed at consumers. Almere no longer needs to feel misunderstood. The question is how real such a vision is. Who will support these visions? The artists, by contrast, do not specify final images and do not in fact come up with concrete proposals. They envisage gradual growth based on the towns existing qualities. Now its the turn of the people of Almere. We can see the results of this teamwork on January 24 when the final proposals are presented.